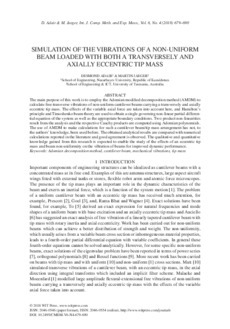 The main purpose of this work is to employ the Adomian modified decomposition method (AMDM) to calculate free transverse vibrations of non-uniform cantilever beams carrying a transversely and axially eccentric tip mass. The effects of the variable axial force are taken into account here, and Hamilton’s principle and Timoshenko beam theory are used to obtain a single governing non-linear partial differential equation of the system as well as the appropriate boundary conditions. Two product non-linearities result from the analysis and the respective Cauchy products are computed using Adomian polynomials. The use of AMDM to make calculations for such a cantilever beam/tip mass arrangement has not, to the authors’ knowledge, been used before. The obtained analytical results are compared with numerical calculations reported in the literature and good agreement is observed. The qualitative and quantitative knowledge gained from this research is expected to enable the study of the effects of an eccentric tip mass and beam non-uniformity on the vibration of beams for improved dynamic performance.